An amazing year on the river, for sure. After unprecedented flooding last year, we've been witness to this deepening drought. Despite a bit of moisture in the parched midwest, our big rivers continue to drop. Revealing new beaches shaped by last year's high waters. And all the treasures...and trash....contained within them. Just below Frene Creek in Hermann, MO., a new beach has emerged. And, of course, the locals have been exploring. We've heard stories of a bone flute and a spear point found there. 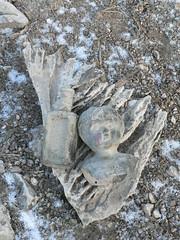 Treasures like medicine bottles from the 1880's. And dozens and dozens of tires. Gary Leabman, co-owner of Spirit Hill Bed & Breakfast and one of the leaders in Hermann In Bloom, teamed up with Jeff Noedel of CountyNewsLive.com to get some energy behind cleaning these tires up while we had the chance. Mayor Pro Tem Ron "Pat" Van Booven brought a tractor, Jesse Geltz brought a ATV (he heard about the cleanup in the CNL and knew he'd be needed), Dave "The River Slave" Marner hopped on the planning process and in two days the whole thing came together. We called it a Trash Mob and everyone got the word out. Saturday at noon 16 volunteers from Hermann, Owensville, St. Louis, Arnold and Columbia showed up with shovels, sledgehammers and chains to make it happen. 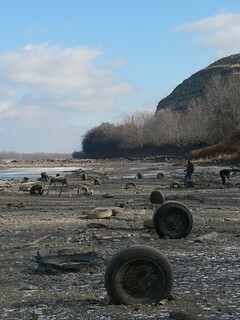 Tires broken loose from the frozen mud got dragged across the flat to the base of the Frene Creek mouth. Ron dragged them all up with a string of tow chains. 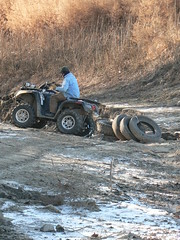 Hours were spent shattering frozen mud and removing it from the tires. Everyone stayed to load our trailer and truck with tires, which we would haul the next day to Scheidegger's Service Center who was storing them and paying to have them recycled. 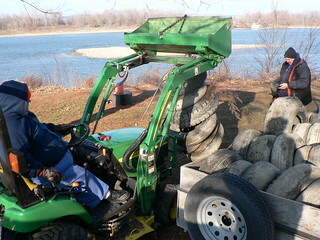 Missouri Stream Team Watershed Coalition's Holly Neill used the Stream Team rotating tire fund to pay Doug Sheidegger for disposal of the tires, each of which costs $2.50 to $20.00 (for the tractor tires). This would get reimbursed by the Mo. Dept. of Natural Resources and be available for the next stream team struggling to get rid of tires. Big thanks to all the hard workers named and unnamed with a special shout out to Tom Ball and Brian Waldrop from St. Louis and Arnold for making the trek to share their expertise and determination with us. Facebook event page, with links to great articles and more photos. Jeff Noedel's awesome article in CNL "Van Booven and Geltz credited with multiplying 'Hermann Beach' clean-up effort of 16 other volunteers"